we will leave from the school at 9:00 a.m. sharp (o.k., maybe not sharp, hopefully not dull) to caravan to the Doss Heritage and Culture Center in Weatherford. The Mission of the Doss Heritage and Culture Center is to collect, preserve and exhibit the heritage of Parker County and Texas. The Museum offers Parker County’s rich tapestry of cattle barons and cowboys. Broadway and television stars, chuck wagons and stagecoaches shared and showcased in galleries that are truly awe-inspiring and reflects all that is Parker County. Our docent guided tour will begin at 10:00 a.m. Sherry will be our guide. Following our tour we will dine at the Whistle Hill Cafe and then return to the Anderson School. Pickup will be at the school at 3:00 p.m. The Doss Center incorporates three distinct and educational galleries that display impressive presentations, including exhibitions from local to world-renowned artists and craftsmen. LUNCH: We will dine at the delightful Whistle Hill Cafe. at the Doss Heritage and Culture Center showcases the talents and skills of fiber artist Katrina Wright. The exhibit began February 12. Katrina Wright has been around art in one way or another all of her life. Growing up in the Southwest, her family frequented galleries and museums where she got to see first hand how art becomes history. Encouraged by her mother and paternal grandmother, she started crocheting at the age of three, knitting at the age of six and dabbling in needlepoint along the way. Although she started sewing at an early age, it wasn’t until Wright received a sewing machine as a present from her husband that she really took to it. Beginning with home decor items and then venturing into the world of traditional quilting, her skill set grew and she realized she had found her own artistic medium. “I find inspiration in simple things like a flower dancing in the breeze or the ever-changing sunsets. I use fibers, many of which I hand-dye myself, to realistically ‘sculpt’ and ‘paint’ these images,” said Wright. Inspired by God’s creation, Wright uses both natural and man-made fibers to create unique pieces of art. She enjoys the challenge of forming the fibers into recognizable images that otherwise might be captured in paint or on film. Currently, she is endorsed by Sulky of America and is a member of the Studio Art Quilts Associates. The artist lives in Texas with her wonderfully supportive and creative husband, their two gifted and spunky children, whom they home school, and one little, scruffy dog who thinks he owns the place. Items from this exhibit are on sale and benefits proceed the Doss Heritage and Culture Center in our effects to collect, preserve, and exhibit the history of Parker County and Texas. We will learn about the famous and infamous cowboys who made Texas a name known throughout the country from the end of the Civil War to the turn of the century. Rugged men and women who brought the cattle to market by driving them along trails to market forever cementing themselves in the annals of Texas history. The new Trail Drivers exhibit opened to the public on February 20th at the Doss Heritage and Culture Center in Weatherford. The cattle drives of Texas represent a critical period in the history of Texas. The drives made by these courageous cattlemen helped the Texas economy recover and thrive after the Civil War. The Trail Drivers exhibition tells the story of Texas longhorn cattle drives in the 19th century and highlights the stories of Charles Goodnight and Oliver Loving. Parker County played an integral role in the development of the Goodnight Loving story and that legacy continues today. Visitors will learn about Charles Goodnight’s Chuck wagon design and how Loving’s body returned to Weatherford after he met his untimely death on the trail. A frequent visitor to our school is named Missy. She is the adorable puppy belonging to Rylee (shown playing chess). Here we provide a picture of just how cute Missy is. Our students are invited to bring animal friends (who are friendly) to spend the day with them at school. we will have C.P.R. & FIRST AID TRAINING at SCHOOL. Drop off at 8:30 a.m. & Pick up at 3:15 p.m. at the school. Certifications will be issued to successful learners (CPR & First Aid). Our friend, Chris Leech, with Premier Safety will again conduct classes for us. FINANCIAL: Fee for both classes:$ 20.00 for children and $25.00 for adults. GIFT SHOP: Yes! The gift of life – the one your child saves with new knowledge (It may be yours). Now that’s a bargain. Our students have reviewed five plays of William Shakespeare and selected “The Tempest” to perform in our annual Shakespeare production, to once again be under the direction of George Rodriquez, who brilliantly inspired students throughout memorable presentations of Othello, Henry V and Richard III (available to view on this website). Plays reviewed by students this year included: The Tempest, As You Like It, Henry IV, Julius Cesar & Much Ado About Nothing. You are invited to join us on May 6 and 7 for ”The Tempest” at the Hardy & Betty Sanders Theater in the cultural district of Fort Worth. Our plays will begin at 7:30 p.m. The process of studying five different plays, not previously performed, familiarizes students with Shakespeare and selecting one empowers them through decision making. Our challenging Shakespeare plays evolve into a testament to courage and dedication our students exhibit. Other past productions have included Hamlet, Macbeth and Midsummer Night’s Dream. We have discovered that children come to love Shakespeare as much as we do, when they are introduced in a dynamic, interactive manner. We will meet at 10:00 a.m. at RAVE 13 THEATER, located in the Mall at 2300 Green Oaks Road, telephone (817) 566-0025, to enjoy the movie Life of Pi, rated PG. Younger students may view another film to be selected with the blessing of Mrs. A. At 1:00 p.m., we will walk to the FOOD COURT in the Ridgmar Mall to enjoy lunch. Following (burp) lunch we will travel to Half-Price Books, located at 475 Sherry Lane, north of Ridgmar Mall –Telephone: 817-732-4111. PICK UP will be at Half-Price Books at 2:30 p.m.
Movie Synopsis: After deciding to sell their zoo in India and move to Canada, Santosh and Gita Patel board a freighter with their sons and a few remaining animals. Tragedy strikes when a terrible storm sinks the ship, leaving the Patels’ teenage son, Pi (Suraj Sharma), as the only human survivor. 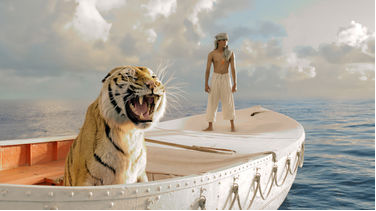 However, Pi is not alone; a fearsome Bengal tiger has also found refuge aboard the lifeboat. As days turn into weeks and weeks drag into months, Pi and the tiger must learn to trust each other if both are to survive. This is an amazing story of a boy in his search to find God and his incredible will to survive. This film is so well done you don’t just see it, you feel it – almost become one with it. We laughed, we cried – the acting and cinematography was so well done, you fell very emotion of Pi just looking in his eyes. Every emotion he had on his journey you feel right along with him. It is a must see for everyone; there are several powerful messages. FINANCIAL: We have been told Tickets are $5.00 but this may be incorrect – please pay at the Box Office Please provide funds for a good book and funds for lunch. Refreshments: Yes! Where precocious children are nurtured, appreciated and eat a lot of popcorn! (Loop 820). We will dine at a nearby eatery. Drop-off will be at the Museum at 9:30 a.m. Pick up will be at the MUSEUM at 2:30 p.m., if the creek don’t rise, which is highly unlikely considering our recent meteorological epistemelogy. Defined narrowly, epistemology is the study of knowledge and justified belief, and my belief is that it may not rain! FINANCIAL $8.00 fee for students. This fee funds our docent program, slush fund for delusional confederates reenacting the war and not fully accepting of Robert E. Lee’s surrender, and entrance to the museum (with a great lesson on soldiering). Please pay Dr. Anderson. – Correct change will result in a very high opinion of you! or use the restroom, without the approval of Dr. or Mrs. Anderson. MUSEUM RULES * No loud talking, running, or jumping or one of the new Anderson school staff will get you. (They are ALL ex-school principals. Notice their threatening gaze searching for any sign of misbehavior! * Stay with your chaperone at all times. If Dr. A seems jittery, he has had enough! Just him offer coffee with cream. * No food, drink, candy, or gum is allowed inside. Give these items to Dr. A., he knows what to do. * The museum has video surveillance & alarms so don’t be alarmed and please smile. No “wheeled” footgear allowed. They reserve the right to refuse service and rough up those who do not wish to follow the rules of conduct. Now, there are exceptions and one of them is Dr. A. He is a good guy and he won’t remember the rules. And he already looks roughed up. Your children are responsible for his appearance, and it is a little late to apologize.